Back in March, Mazda became one of the last major car manufacturers to announce launch plans for CarPlay support. Mazda's first announced vehicle with CarPlay is the 2018 Mazda6, with owners of Touring trim and above able to bring their vehicles to a Mazda dealer for a free upgrade starting this month. CarPlay will be available pre-installed in Mazda6 vehicles with Touring trim and above as of November, while Mazda's 2019 CX-9 is also just starting to roll out with CarPlay available pre-installed. While the general CarPlay experience is consistent across car brands, as it's driven by your connected iPhone, there are some differences in how CarPlay interfaces with manufacturers' various infotainment systems and hardware, so it's worth taking a look at the CarPlay experience in a Mazda. 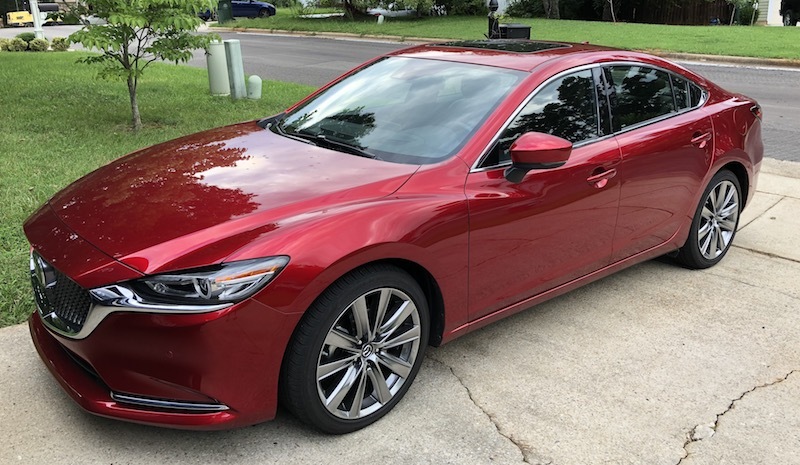 I've had a chance to spend some time with a CarPlay-equipped 2018 Mazda6 Signature, and CarPlay is a welcome alternative to the built-in Mazda Connect infotainment system that has garnered mixed reviews over the years. 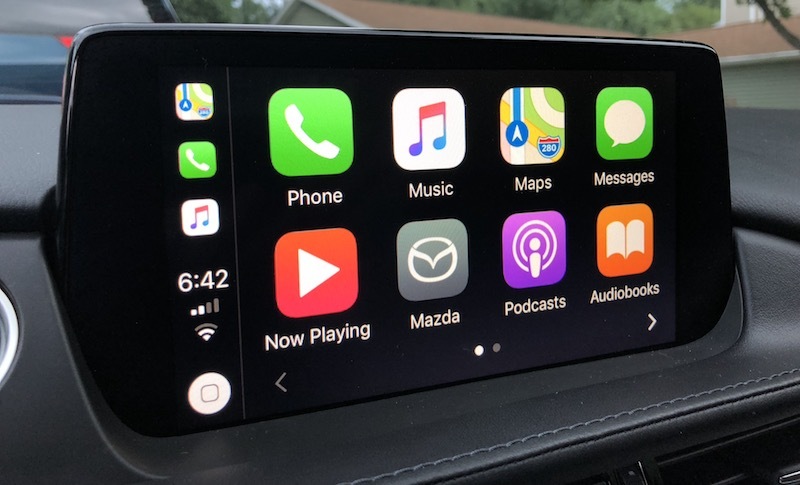 Before we touch on CarPlay, it pays to take a look at Mazda Connect, as that's the software and hardware CarPlay sits on top of. Mazda has opted for multiple control options in its vehicles, with both an 8-inch touchscreen on the dashboard and a commander knob with associated buttons on the center console. A smaller dial next to the commander knob lets you adjust volume without reaching up to the dashboard, or you can adjust the volume from the steering wheel. Voice control through a button on the steering wheel is also available. Touchscreen operation is unsurprisingly straightforward, while the commander knob offers a flexible array of input methods including twisting, rocking, and pressing the knob to navigate around. The cluster of buttons around the knob lets you jump quickly to navigation, music, favorites, the Mazda Connect home screen (or CarPlay home screen if active), or back to the previous screen. Navigating the interface with the commander knob can be a bit clunky at times, particularly if you have to navigate through several menu levels, but overall it's a satisfactory experience similar to that offered by a number of other manufacturers. One important thing to note is that while the Mazda Connect system includes a touchscreen, it's locked out while driving in order to reduce distractions, requiring you to use the commander knob or voice to control the system. (The lockout is only while the car is in motion, so the touchscreen does work while stopped at a stoplight, for example.) Mazda is one of the most conservative carmakers in this regard, but forcing users to the commander knob can actually be a detriment in some cases where reaching over to the display for a quick tap would likely be less distracting than using the knob to scroll over to the desired option. A significant part of what makes CarPlay such a welcome addition is that Mazda Connect has a few shortcomings. I found overall navigation of the interface passable but a bit clunky with the commander knob. The user interface layout is decent enough for touchscreen control, but when you're forced to use the commander knob it can be something of a chore to navigate through the options. 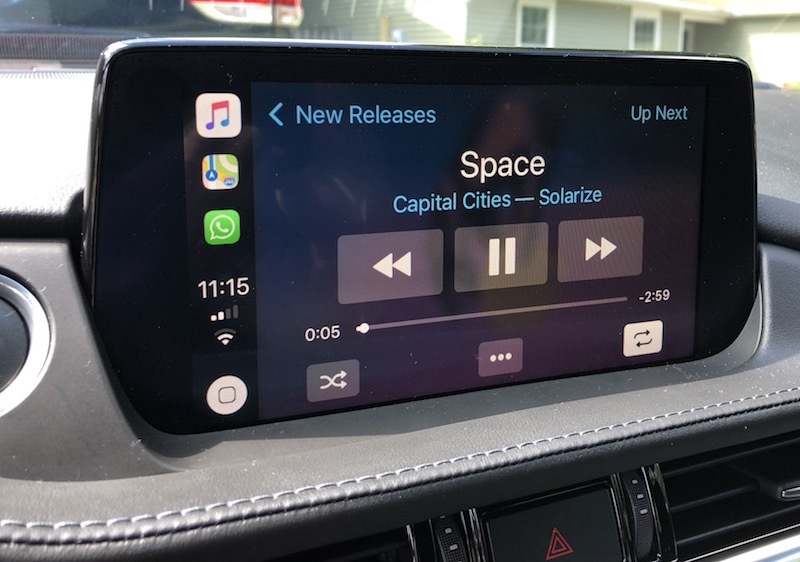 The overall look of Mazda Connect isn't bad by car infotainment standards, although it could certainly stand to see some modernization, and there are some curious design decisions such as not allowing enough characters to display song titles completely. With a nice, big 8-inch screen, it shouldn't be the case that song titles are routinely cut off. 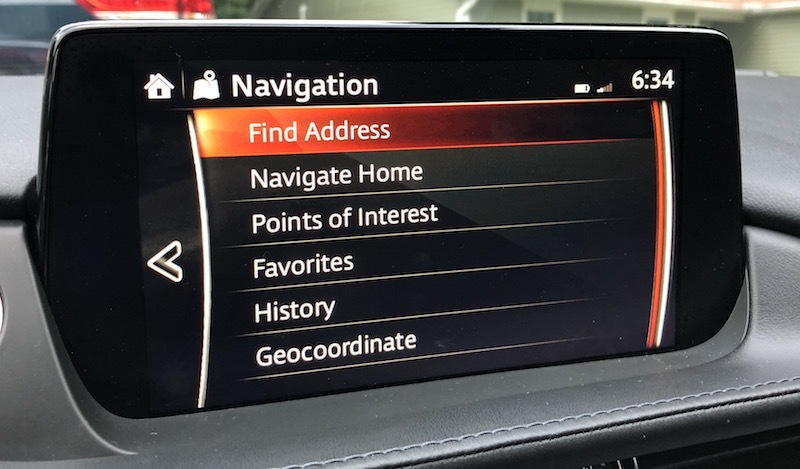 Built-in navigation through Mazda Connect also leaves a bit to be desired, as I found the system unable to parse some of the destinations I tried to input by voice and the POI database seemed rather weak, making it difficult to find some destinations. In one test trip, the onboard GPS tracking seemed to be improperly calibrated, and navigation was useless as the map continually showed me driving off into the woods. On all other trips, however, the GPS location and directions were accurate, so the problem I experienced may have just been a one-off bug. It's also an issue I've occasionally seen with my iPhone, so maybe there isn't really that much difference in performance here. Otherwise, the navigation system performed well with helpful turn-by-turn directions and depictions of road signs at major junctions. A handy optional feature also displays cross streets as you approach you them, even if you don't have a navigation route running. Another helpful view displays along the right side of the screen which amenities like gas, food, and auto repair are available at upcoming exits. Mazda Connect also isn't known for being speedy, with the most significant chokepoint being at initial boot. Upon starting the car, it took 15 to as much as 40 seconds for Mazda Connect to boot up, display a warning to keep your eyes on the road, and become available to use. Loading directly into navigation can take a few seconds longer. It doesn't necessarily sound like a huge amount of time, but when you just want to hop in your car and go it can feel like an eternity. Unfortunately, CarPlay doesn't help with this, as Mazda Connect has to fully boot up before CarPlay can be recognized as available, so you still have to wait. Once you're into CarPlay, things work mostly as expected. All of the familiar CarPlay apps are there, and you can navigate through them by touch (with one big caveat discussed below), the commander knob/buttons, or voice. One important difference for Mazda is that the touchscreen lockout while driving also extends to CarPlay, which means you'll need to use the commander knob to scroll through highlighted user interface elements. It's an officially supported input method for CarPlay, but ultimately it's less convenient for an operating system that's designed to be manipulated by touch with minimal distraction. Touchscreen input works fine with CarPlay when the car isn't in motion, so it's simplest to get as much set up for your drive as you can before you set out and make adjustments at stoplights. Commander knob ease of use will obviously improve as you spend time using it and muscle memory takes over for some tasks, but it's rarely going to be as convenient as a direct touch interface. While the commander knob can be a little inconvenient for navigating the user interface, some frequently used functions like play/pause (press the knob) and back/forward (rock the knob) are simple and intuitive. It's the more complicated operations that involve scrolling through various UI elements to make a selection that are more cumbersome to accomplish with the knob than a touchscreen tap. 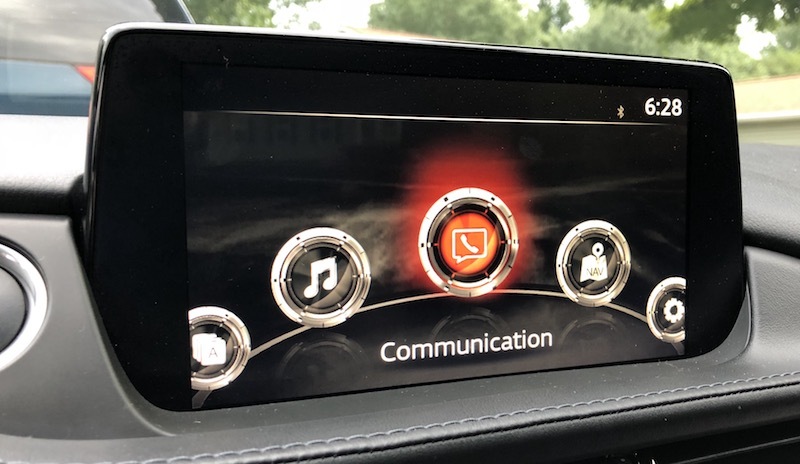 As with the touchscreen lockout for Mazda Connect, Mazda tells me the extension to CarPlay is a "conscious choice" based on its feeling that the knob is less distractive than using a touchscreen while the car is motion. I'm not sure I necessarily agree when it comes to CarPlay, as Apple has put considerable thought into keeping the interface simple enough that you can grab relevant information at a glance and quickly tap what you need. 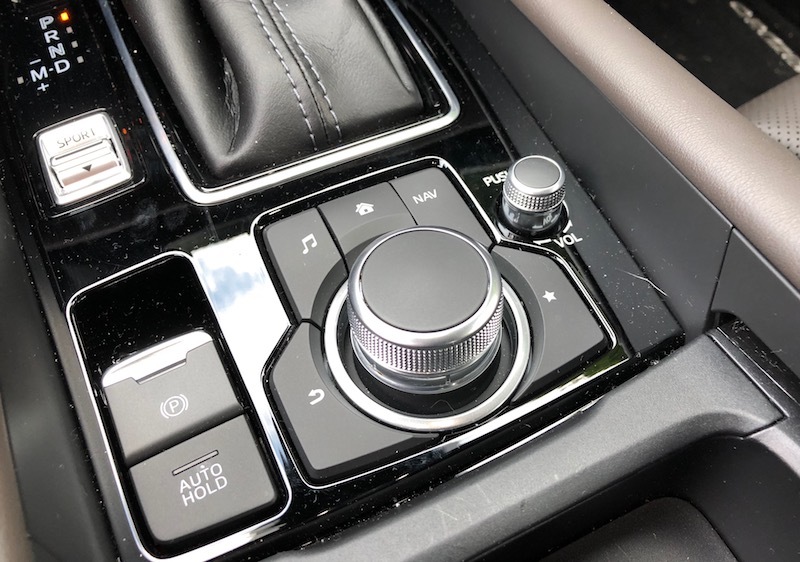 Beyond the knob itself, the associated hardware buttons surrounding it do come in handy for CarPlay. The navigation and music buttons make it easy to jump back and forth between frequently used screens, and it hops in and out of CarPlay as needed – such as when you have Apple Maps active while listening to XM radio and the buttons correctly take you to the proper music and maps apps. The system also remembers if CarPlay is active when you turn off the car, and takes you back to it when you start up again. One other thing to note is that if your phone is plugged into the car, pressing the talk button on the steering wheel appears to only activate Siri. I was unable to find a way to activate the Mazda Connect voice system while the phone was plugged in, even if CarPlay wasn't necessarily active. Some systems like BMW's offer dual access via the talk button, bringing up Siri with a short press or the onboard system with a long press. Mazda tells me it decided not to offer dual access because its research concluded that customers found it confusing. 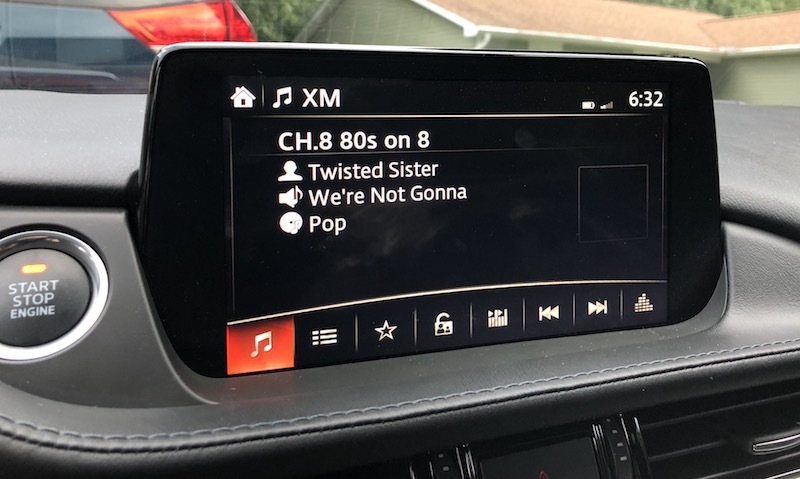 Changing terrestrial/satellite radio stations is the only thing Mazda Connect's voice system can do that Siri can not, and that task can also be accomplished in some regard by using buttons on the steering wheel. Mazda has been thoughtful with the placement of various ports, helping to keep cords and devices tucked away. 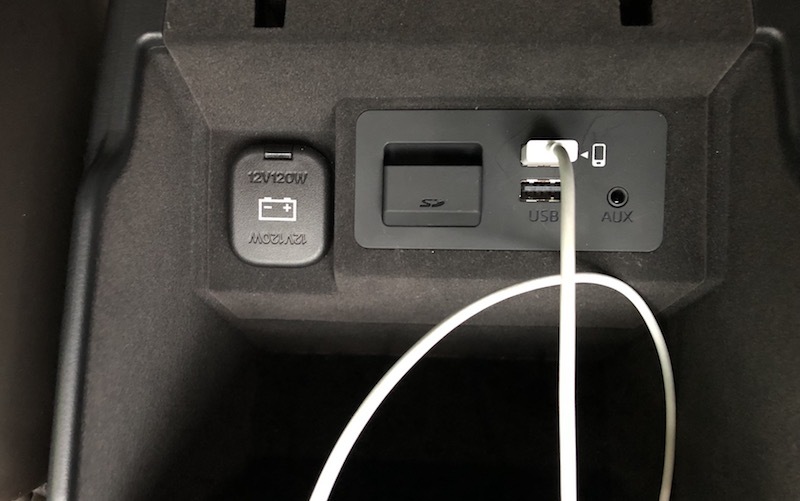 Two USB ports (one designated for connecting a phone to Mazda Connect), an Aux port, an SD card slot used for loading maps into the onboard navigation system, and a 12V power port are all hidden away in the center console compartment. 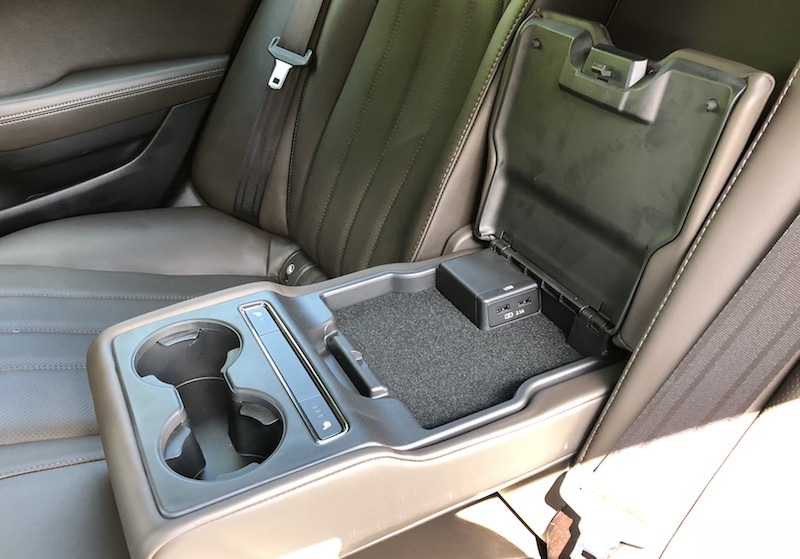 The compartment isn't particularly roomy, as the gearshift, commander knob, and cupholders take up much of the console space, but it lets you keep your phone out of sight. If you prefer to have your phone in a cupholder or the storage tray at the front of the console, there's a sufficient gap on either side of the console compartment lid to easily run the cable out without pinching it. In the rear, the middle seatback folds down to offer a pair of cupholders, controls for heated seats (if equipped), and a shallow storage compartment housing a pair of 2.1A USB ports, which is great for keeping the kids' iPads charged up. Mazda does not, however, offer a Wi-Fi hotspot option to keep those devices connected to the internet. With CarPlay adoption growing rapidly over the past several years, it's become more of a must-have feature for car buyers, so it's great to see Mazda finally get on board with the technology. I know several Mazda owners who have been waiting patiently for CarPlay support, and while it's unfortunate there are no signs yet of retrofit availability beyond the current Mazda6, at least those loyal Mazda owners can look forward to it in their next car. Infotainment systems from car manufacturers across the board are notorious for design and performance that don't reach the level of polish we've come to expect from our smartphones, and Mazda Connect is no different here. 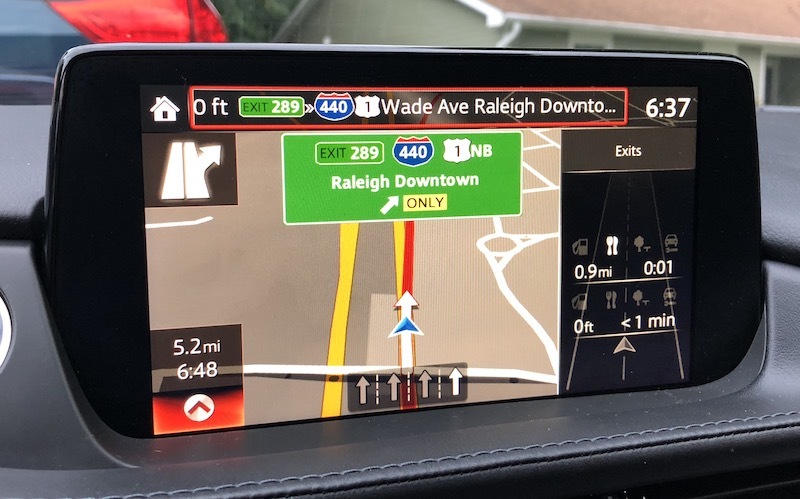 The whole Mazda Connect system could use a refresh to modernize the look and improve performance, but once you get familiar with the operation it's a decent system beyond the issues I had with navigation. Of course, any shortcomings in onboard systems like Mazda Connect serve to increase the value of CarPlay support, which lets you use the apps you're already familiar with right on the dashboard and have all of your contacts, music playlists, maps history, and more at your fingertips without needing to rely on incomplete and sometimes cumbersome syncing of data to built-in car systems or audio-only connections over Bluetooth or Aux. And with CarPlay expanding to support third-party maps apps like Google Maps and Waze, even more iPhone owners may be willing to become regular CarPlay users. The 2018 Mazda6 and the new 2019 CX-9 will be the first Mazdas to get CarPlay support, but it's reasonable to expect that the rest of the lineup should get it as the new model years are introduced. Unlike some other manufacturers, Mazda isn't charging extra for CarPlay, so far simply bundling it into all tiers above the entry-level Sport trim. The company has not, however, announced any plans to offer retrofit CarPlay support on any models other than the 2018 Mazda6 that's currently in the middle of its production year. The 2018 Mazda6 starts at an MSRP of $21,950, although the minimum Touring trim required for CarPlay begins at $25,700. The new 2019 CX-9 starts at $32,280, with the Touring trim beginning at $35,330 needed for CarPlay. I've asked Mazda several times, and all they'll tell me is "nothing to announce at the moment" regarding possibility of retrofits for other models. So I wouldn't rule it out down the road, but they're being very cagey for now. Any CarPlay reviews should clearly indicate whether or not it supports wireless CarPlay, along with whether or not the car has built-in Qi wireless charging. I have now used CarPlay in a rental car for a few weeks, and I was shocked at how bad the UI is. 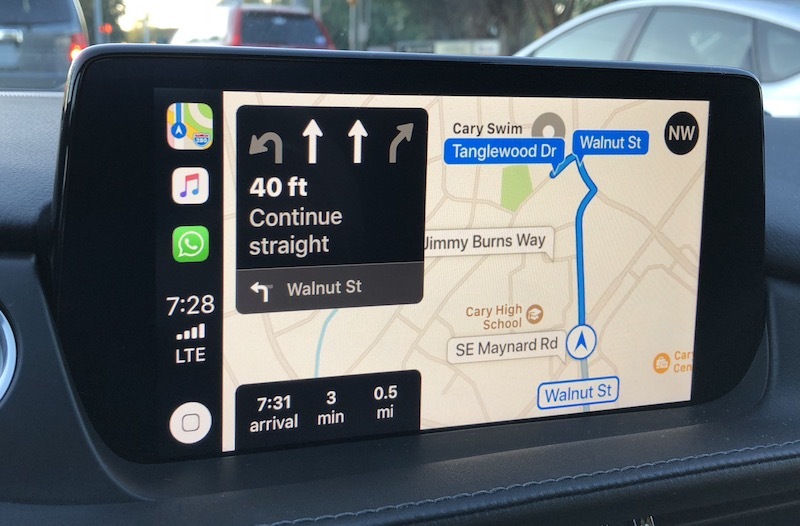 You can see it in the image in the article showing Apple Maps on CarPlay in action - approximately 2/3 of the screen is covered in stuff that isn't the map. You've got a lot of space taken up by other app icons, a home button, various status icons and a clock. Those app icons definitely aren't necessary - the home button is sufficient for getting to other apps. Which - why is that button there at all? Your phone already has a physical home button that does the same thing. And your car probably has a dedicated button that does it, too. Clock is good. The status icons are redundant - why do you need to know both your cellular signal and your wifi signal at the same time? Then there's a very large box showing you what's up next, but despite how large the box is, the text in the box is too large for it and it's forced to wrap awkwardly. End result is that about half of the large black box is simply empty space that covers up your maps. Then there's another box with a few more stats. This is fine and useful information, but it's presented in a weird spot that could otherwise have map in it. I'd recommend moving them to where all the app icons are. That's the extent of what is visible in this screenshot, but the UI is actually worse (if you can believe it.) When you get a text message, what happens? An enormous black box covers the top half of the screen for the next several seconds, blocking out the lane guidance and next steps, plus the map showing you what those next steps are. That box doesn't contain your message in it - it just tells you who sent it and nothing else. Oh, you have a passenger in the car who wants to use your phone - perhaps to change which song is playing or to respond to a text message for you? Your maps go away when they do that. There's some other negatives I could bring up about it. The only pro I can think of is it's nice that you can type in stuff on your phone instead of on a crummy car touch screen, but really, you have the same thing going for you if you just mount your phone in front of that touch screen. Is this an improvement over other built-in systems? Maybe in theory? In practice? CarPlay is a total dumpster fire. I think it's a real testament to how incredibly bad the built-in systems are that people want CarPlay instead of it. Too little too late for me. After successive Mazda CX-9s and years of promises that CarPlay was coming, I switched to another car maker in May when there was still no support from Mazda. Shame because I really enjoy how they drive. If it's not wireless I'm not interested. What is a retrofit exactly? I’m not really familiar with it. I did the retrofit to my 2014 Mazda 3 last weekend. Basically its just two new wires you have to run from your usb hub to the back of the stereo unit connected to the screen and a software upgrade done by usb. The usb hub is replaced during the process as well. It took me about an hour after researching the procedure. $170 in parts from Mazda. Works great! Just to add, the parts are available in the U.S., but Mazda owners are reporting it is hit or miss on whether the dealerships will allow them to purchase. My understanding is the parts are in short supply and Mazda6 owners are being given first opportunity to purchase. Mazda has only officially announced the retrofit for this particular model. Yeah they cancelled my order the first time around. The second time I grabbed a mazda 6 vin from a dealership website and included it in my order and it went through. Installed last weekend and it works great. I see your points but I think you are exaggerating slightly. For one, you can tap that navigation info box and it collapses to 1/3 of the size. Less than half of the map is covered up. I agree that the map is covered a little, though. However, in real world use, everything you need to see is available. Its not covering up your path. Most of the stuff you are talking about taking up space is in one side bar. When you get a text, it covers up about 1/6th of the screen for 5 seconds. Yeah it could be a smaller notification, but its not that big a deal. The changing of apps problem is legit. If I pick up my phone and change the song, it shouldn't back out of the maps on the head unit. This is just sloppy design and was probably the easiest thing for them to do, having the screen mirror your iphone screen. The pros to me are being able to use a real mapping application, and smooth text response. The real game changer will be when waze and google maps are updated to work with carplay. I have had many cars with built in nav and all of them where terrrrrrible. So I wouldn't call it a dumpster fire. It was a solution to a problem that didn't really exist. There just isn't too much that it does yet. Compared to the general map view when using the manufacturers navigation is that it is almost full screen map. But the thing is that its landscape! I don't need to see what is way left and way right out of my way so the Apple map was totally sufficient to me. What I used my phone for navigation before CarPlay I had it always in portrait orientation so I could see as much as possible of the way ahead of me. To my knowledge, BMW/MINI is the only manufacturer to offer wireless CarPlay so far. Mercedes should be coming soon. And no, Mazda doesn't offer Qi charging in the Mazda6, though that is becoming a more widely offered option in general, so hopefully we start seeing a lot more of that soon. Wireless CarPlay plus Qi charging is a very convenient setup. Terrible that it's only on the touring model. Kind of pricy. Other companies this comes standard on entry/near entry level models. My Equinox was very cheap and it has a beautiful big screen to display CarPlay. To be clear, Touring is the second-lowest of five trims on the Mazda6. Only the base Sport trim doesn't get it. Each Mazda region (Country) is handling the CarPlay/Android Auto update a little differently. 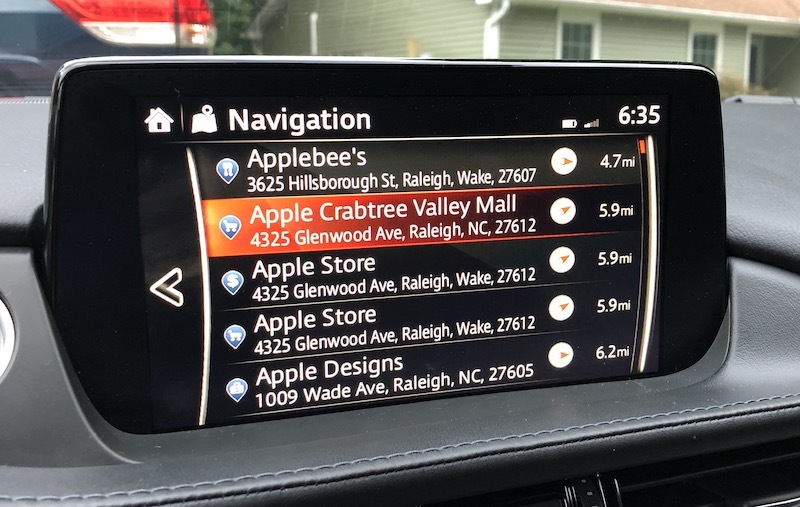 In the U.S., Mazda supplied all of its dealers with the number of CarPlay/AA retrofit kits as that dealer ordered 2018 Mazda6 models that have Mazda Connect infotainment systems. The dealers were instructed to reserve ALL of those CarPlay/AA retrofit kits for the 2018 Mazda6 and only the 2018 Mazda6. But that hasn't prevented some dealers from selling the retrofit kits over the counter to owners of other Mazda models. I know, because I bought two of the kits. Both my 2017 Mazda CX-5 and 2016 Mazda Miata now have CarPlay/AA installed. I did the installation myself, including the necessary firmware update to Mazda's latest infotainment software version. I paid $183 each for the kits, delivered to my home. It took me 2.5 hours to do the entire update (start to finish) on my CX-5 and took only 1.5 hours to do the update to my Miata. CarPlay works beautifully (I don't have an Android phone so I didn't test that). It's notably faster than Mazda's user interface and having SIRI available at the touch of a steering wheel button is a treat. SIRI is WAY faster under CarPlay compared to using SIRI (pressing button on phone) through Mazda's UI. Going forward, CarPlay will be mandatory in all of my new cars. There's no going back. The Mazda CarPlay/AA retrofit kit will fit and work in any current Mazda that already has the Mazda Connect infotainment system. I believe that's as far back as 2012 or 2013 for some of the Mazda models (but not necessarily all of them). BTW, CarPlay/AA doesn't entirely replace Mazda's UI. Meaning, you can still use Mazda Connect if you want. You can easily toggle between the two different UIs. 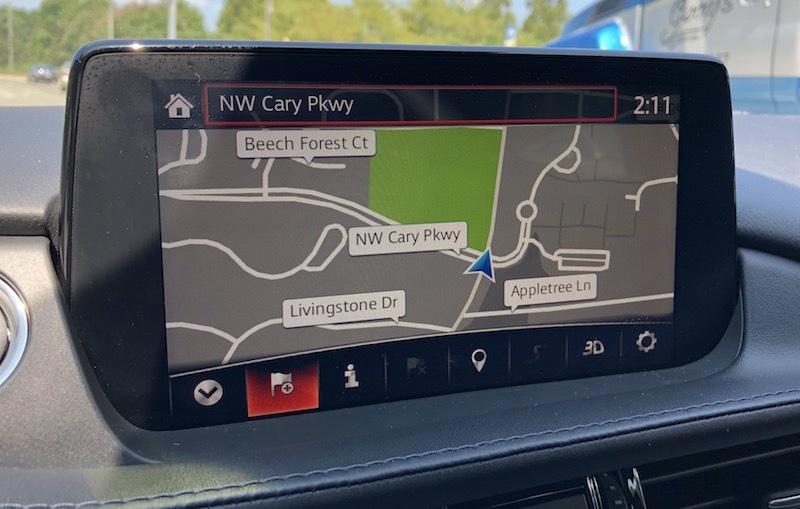 You can still use Mazda's Navigation for directions while you are using CarPlay for music or podcasts. And, with iOS 12 and Goggle's latest version of Google Maps, you can navigate with Google Maps instead of Apple Maps. A new version of Waze that is compatible with CarPlay is coming in October.